Born and raised in Wilmington, DE, Eric Marcinizyn is a rising star in black and gray tattoo. Tattooing for just three and a half years, he mixes West Coast styles with East Coast reference point. 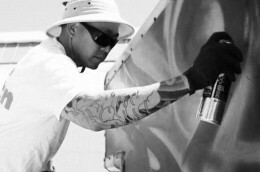 Marcinizyn cut his teeth as a graffiti artist and formalized his art training with a degree in graphic design from the Art Institute of Philadelphia. His strengths are in portraiture, but his talents extend to finely articulated narrative pieces.